Car of Parts is this home-made “Weep,” Edwarcl G. Hammond, retired Newton, Mass., lumber merchant. 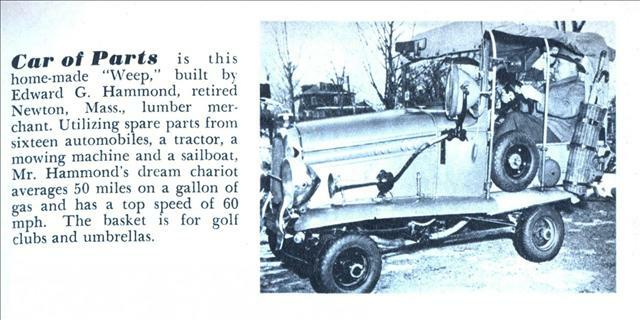 Utilizing spare parts from sixteen automobiles, a tractor, a mowing machine and a sailboat, Mr. Hammond’s dream chariot averages 50 miles on a gallon of gas and has a top speed of 60 mph. The basket is for golf clubs and umbrellas.